Hybrid Adobe is a revolutionary building material used to create low-cost insulated homes, sculptures, domes, garden walls, and more. Its sustainability makes it appealing to green builders. Its adaptability makes it appealing to creatives. Hybrid Adobe combines recycled paper with earth, sand, and a binder to create a sustainable, inexpensive, strong, fibered material that can be poured, sprayed, or sculpted, to form blocks, logs, panels, walls, and an infinite variety of creative shapes. Philip Mirkin has launched another website to showcase his work with Hybrid Adobe and publicise his workshops, easyadobe.org. Please check it out! This Earth Day please join Philip Mirkin for the first HYBRID ADOBE WORKSHOP in two years, to be held Saturday, April 19th on the campus of UCSC. You will learn to build inexpensive sustainable housing at this fun, one-day, hands-on workshop. We will construct a small building and/or sculptural bench, and more. Please join us! Read more in the press release which contains the vital information. Please download this flyer that can also be printed and distributed. Please forward this announcement to friends, colleagues, organizations, the media and/or list-serves. Your help is urgently needed in supporting KATRINA SURVIVORS who are coming to Southwest Colorado for FREE JOB TRAINING in Natural Building to rebuild their communities on higher ground. They’ll receive free housing and free counseling during their stay here. For details read the Press Release or contact Philip Mirkin directly. Hybrid Adobe International offers help to displaced people while assisting them to help other refugees rebuild their lives and homes. Successful graduates of the immersion program will also learn to create their own business as a builder, landscaper, workshop leader, designer, consultant, artisan or sculptor using Hybrid Adobe. For details read the Press Release or contact Philip Mirkin directly. Come to a seminar and booksigning by Hybrid Adobe founder and author, Philip Mirkin. A two-hour introductory seminar on June 30th explains Hybrid Adobe (lightweight adobe) and papercrete including recipes, procedures and applications. This evening presentation will show participants how to sculpt, build and create with this sustainable material. 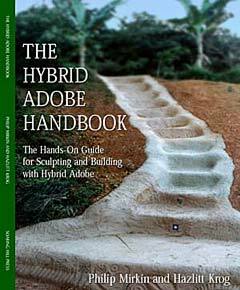 Philip will sign copies of the new 5th edition of the "Hybrid Adobe Handbook." For details read the Press Release or contact Philip Mirkin directly. Two Hybrid Adobe Workshops (Lightweight mud-brick) will be given on the weekends of 2-3 April in Coromandel and 16-17 April on Waiheke Island (advanced training on 18-19 April). Due to overwhelming interest and two sold out workshops (we built a dome for the children at the Primary School in Blackpool and a stairwell at the Steiner Kindergarten in Waiheke) we offer two more chances to learn Hybrid Adobe. Read the Press Release or contact Philip Mirkin directly for more details. A hands-on workshop teaching Hybrid Adobe recipes and applications, will show participants how to sculpt, build, and create with this sustainable material. Workshop leader Philip Mirkin is traveling in New Zealand. He will be leading the workshop on Waiheke Island. Read the Press Release or contact Philip Mirkin directly for more details. A unique program offers the chance to explore the magnificent Southwest while learning new techniques of Earth friendly building on an actual housing project. A hands-on workshop happens September 18-19. Work trades and internships are available and include travel adventures. At our travel basecamp in the Four Corners you'll learn how to build with Hybrid Adobe and papercrete and also enjoy adventures to National Parks and wilderness areas nearby as we combine 15 years of experience in adventure travel and sustainable building into a new concept in outdoors learning. Some work exchange may be available. Read the Press Release or contact Philip Mirkin directly for more details. We recently joined several webrings that focus on green building techniques. Alternative Building Techniques & Construction is comprised of a group of websites providing information on alternative building materials, techniques, and processes. Participating sites also include coverage of strawbale, adobe, rammed earth, cordwood, log, post & beam, stone, earth ships and now Hybrid Adobe. Building with Earth is comprised of a group of websites that focus on adobe, cob, earth bags, earthships, rammed earth, papercrete, and earth plaster over strawbale. The Eco-Build Web Ring, is devoted to research and information groups dedicated to improvement of the built environment in balance with the natural environment. Green Building Webring is comprised of green builders and green building material manufacturers and spreads the message that "there is another way, an earth friendlier way to build!" The Green Building Webring is comprised of research and information groups dedicated to improvement of the built environment in balance with the natural environment. Later this summer, you are welcome to come to the beautiful Four Corners Region of the American Southwest and learn how to build with Hybrid Adobe. You will work on an actual house building project and experimental building designs. We are offering flexible multi-day programs that will also cover many applications of this revolutionary material. This is our sixth year of work exchange programs, and our 17th year offering wilderness and humanitarian aid relief journeys. The schedule is still being finalized. For details, please contact Philip Mirkin. Hazlitt Krog, Philip Mirkin's co-author on The Hybrid Adobe Handbook will be giving a Hybrid Adobe seminar at at the Solfest, August 21 & 22, 2004. The schedule is still being finalized. For details, please contact Hazlitt Krog . The first general release edition of The Hybrid Adobe Handbook is now available. Co-authored by Philip Mirkin and Hazlitt Krog, this 52 page illustrated book explains everything the first-time Hybrid Adobe experimenter needs to know to get started with this revolutionary building material. Read more. The final day of the 5-Day Natural Building Intensive, 9:00 AM - 5:00 PM on May 7, 2004 at the Real Goods Solar Living Center, Hopland, CA will be led by Philip Mirkin. Hazlitt Krog will assist. Copies of The Hybrid Adobe Handbook will be available for purchase. Read details. A Testimonials page has been added to the site with quotes from workshop participants, builders, and sculptors. Please send in your quotes and/or photos for us to post! Our book, The Hybrid Adobe Handbook is now available.